Mary Cassatt (1844–1926), Woman with a Pearl Necklace in a Loge (1879), oil on canvas, 81.3 x 59.7 cm, Philadelphia Museum of Art, Philadelphia, PA. Wikimedia Commons. The most significant anniversary this year in art history is the centenary of the death of Edgar Degas (1834-1917). In preparation for a series in which I will try to cover his work, I thought it might be useful to look at the art of some of those who were in his circle of friends. I start with a short series of articles looking at Mary Cassatt (1844-1926), and how Degas and the French Impressionists influenced her art. Mary Stevenson Cassatt was born in Allegheny City, PA, into an affluent family. As a child she travelled with her family to Europe, where she learned German and French, and would have seen an extensive display of modern paintings at the Paris World’s Fair in 1855, and elsewhere. Despite family objections, she started as a student at the Pennsylvania Academy of the Fine Arts when she was 15, an unusually young student. Although one in five of its students were female at the time, women were excluded from life classes, and spent much of their time drawing from casts. 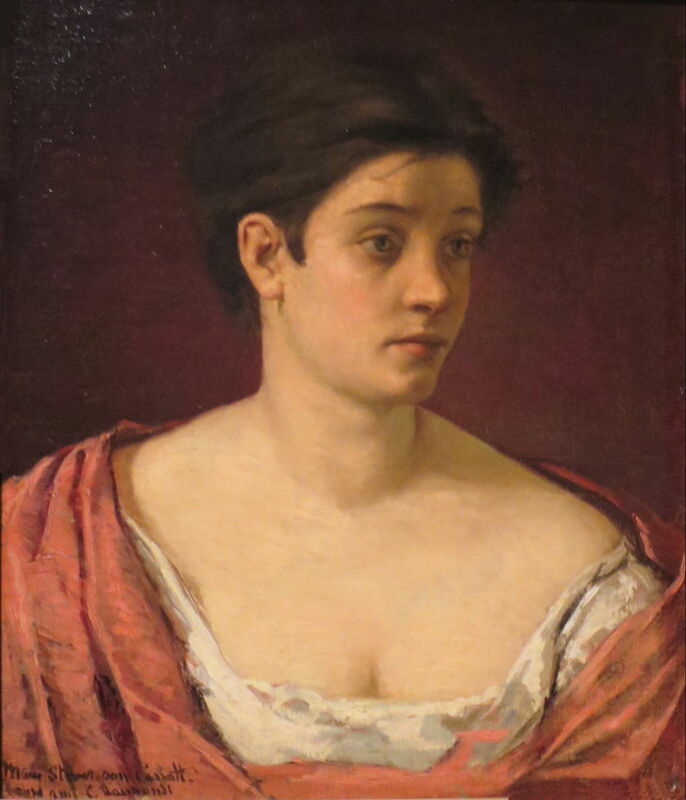 Cassatt terminated her studies, and persuaded her family to allow her to study in Paris, even though the École des Beaux-Arts didn’t yet admit women students at the time. Chaperoned by her mother and others, she became a pupil of Jean-Léon Gérôme in 1866, and started copying in the Louvre. At the end of that year, she began classes with Charles Chaplin (the genre artist, not the silent movie star), and in 1868 studied with Thomas Couture. 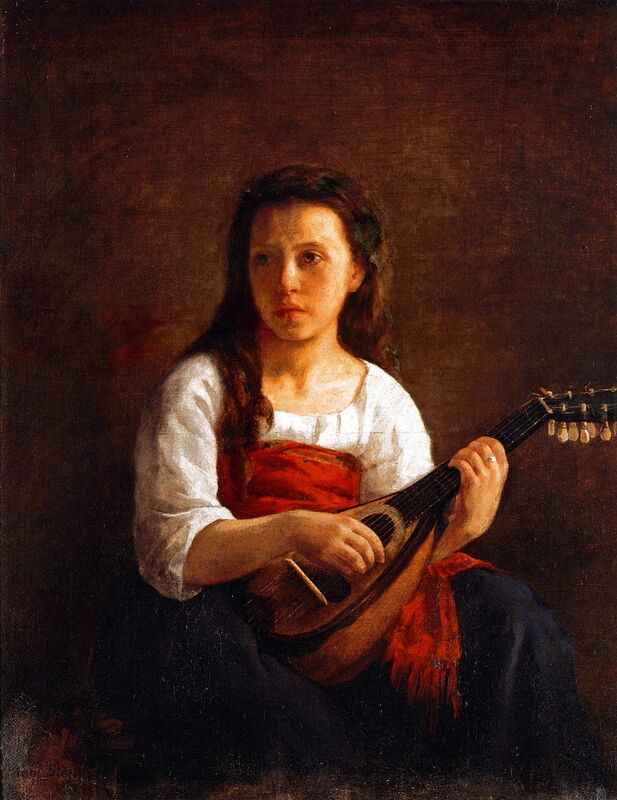 Mary Cassatt (1844–1926), The Mandolin Player (1868), oil on canvas, 92 x 73.5 cm, Private collection. The Athenaeum. Cassatt had early success with The Mandolin Player, which was one of the first two works by American women artists to be accepted for the Salon, in 1868. Mary Cassatt (1844–1926), Child Drinking Milk (c 1868), pastel on paper, dimensions not known, Private collection. The Athenaeum. It is sometimes implied that Cassatt learned her skills with pastels from Degas. 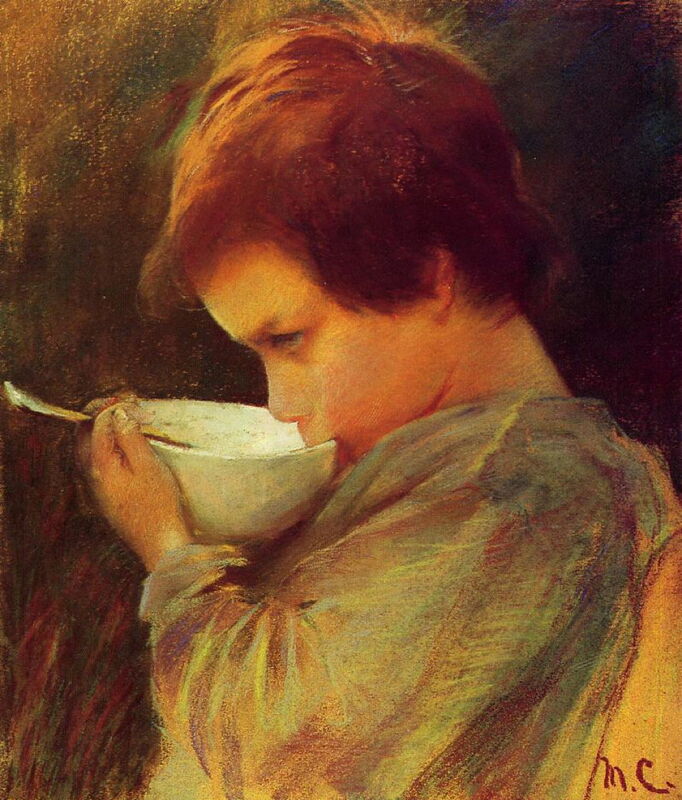 However, her pastel painting of Child Drinking Milk from about 1868 attests to an already high standard in the medium, and to a modern style. With the start of the Franco-Prussian War in July 1870, the Cassatts swiftly returned to the USA, where she lived in Altoona, PA. Mary continued to paint, with little success, being unable to sell her work, and unable to study the works of other painters. Some of her paintings were also lost in the Great Chicago Fire in 1871. However, she was then commissioned to copy two paintings by Correggio in Parma, Italy, and in 1871 returned to Europe with another artist, Emily Sartain (1841-1927), a master print-maker and portraitist. Mary Cassatt (1844–1926), During Carnival (1872), oil on canvas, dimensions not known, Private collection. The Athenaeum. 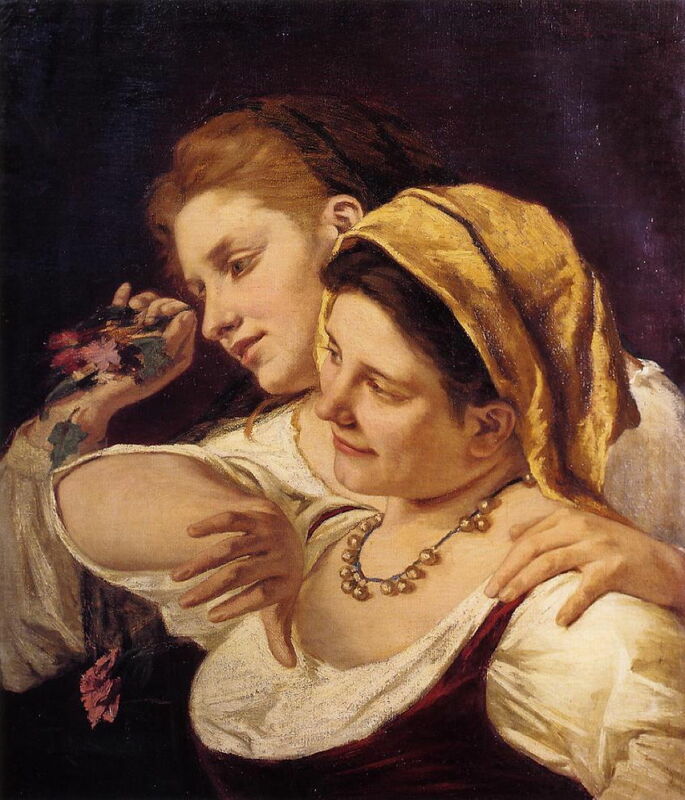 (Two Women Throwing Flowers) During Carnival was probably painted when Cassatt was copying in Parma, Italy, in 1872, and was not only accepted for the Salon of that year, but sold there too. 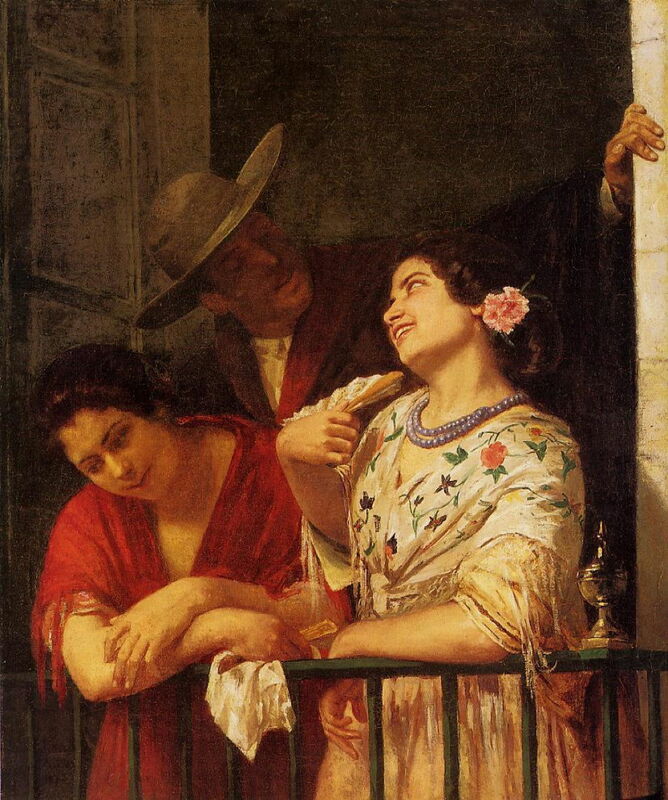 Mary Cassatt (1844–1926), The Flirtation – A Balcony in Seville (1872), oil on canvas, dimensions not known, Philadelphia Museum of Art, Philadelphia, PA. The Athenaeum. Later in 1872, Cassatt travelled to Spain, where she painted The Flirtation – A Balcony in Seville (1872) and visited Madrid too. Mary Cassatt (1844–1926), Portrait of a Woman (1872), oil on canvas, dimensions not known, Dayton Art Institute, Dayton, OH. Wikimedia Commons. Portrait of a Woman (1872) seems to have been painted when Cassatt was in Spain. Mary Cassatt decided to settle in France in 1874, and shared an apartment in Paris with her sister Lydia, with whom she was very close; Lydia became a favourite model for many of her paintings. Mary Cassatt (1844–1926), Eddy Cassatt (Edward Buchanan Cassatt) (1875), oil on canvas, 147.96 × 109.86 cm, The National Gallery of Art (Gift from the Family of Col. Edward Buchanan Cassatt), Washington, DC. Courtesy of The National Gallery of Art. 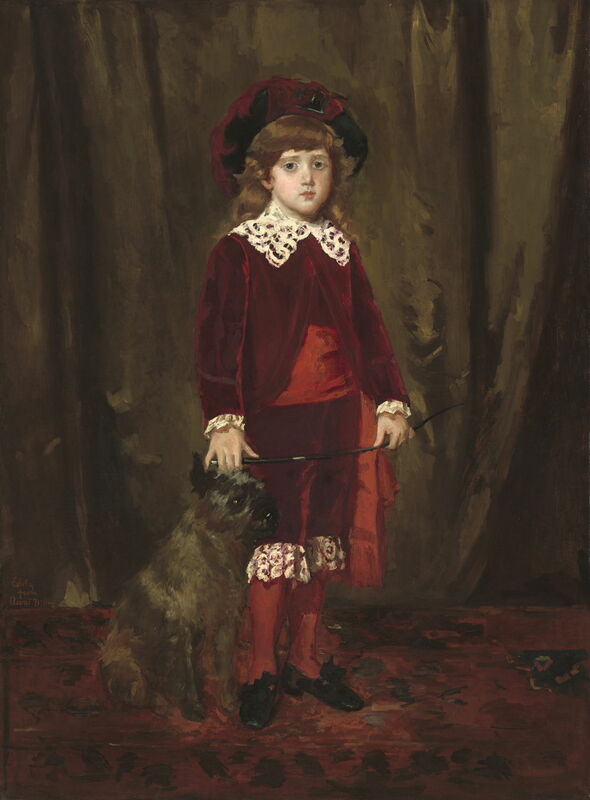 Eddy Cassatt (Edward Buchanan Cassatt) (1875) is a portrait of Mary’s young nephew (1869-1922), who became a notable American soldier and owner/breeder of racehorses. During the late 1870s, Cassatt encountered increasing difficulties in getting her work accepted by the Salon. She disliked the work of the favoured artists of the day, including Cabanel and Bonnat, and in 1877 both her entries were rejected. She had become increasingly impressed with the work of some of the Impressionists, particularly since she had first seen the pastels of Edgar Degas. When Degas invited her to exhibit with the Impressionists at their fourth exhibition in 1878, she seized the opportunity, although that exhibition was postponed to the following year. 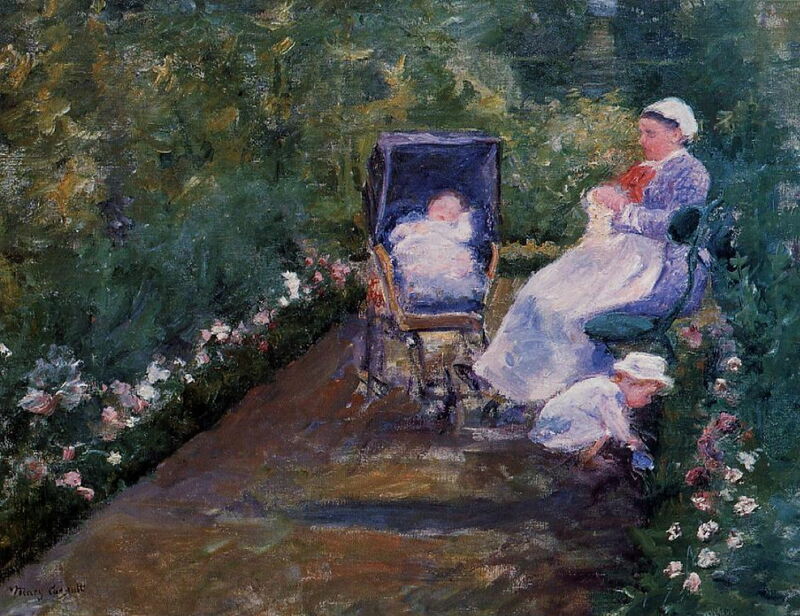 Mary Cassatt (1844–1926), Children in a Garden (1878), oil on canvas, 73.3 x 92.1 cm, Private collection. The Athenaeum. During the late 1870s, Cassatt’s painting style became overtly Impressionist, under the influence of her new-found friends. This is perhaps first obvious in this rather dark painting of Children in a Garden (1878), where her brushwork has loosened considerably. Mary Cassatt (1844–1926), Little Girl in a Blue Armchair (1878), oil on canvas, 89.5 x 129.8 cm, The National Gallery of Art (Collection of Mr. and Mrs. Paul Mellon), Washington, DC. Courtesy of The National Gallery of Art. 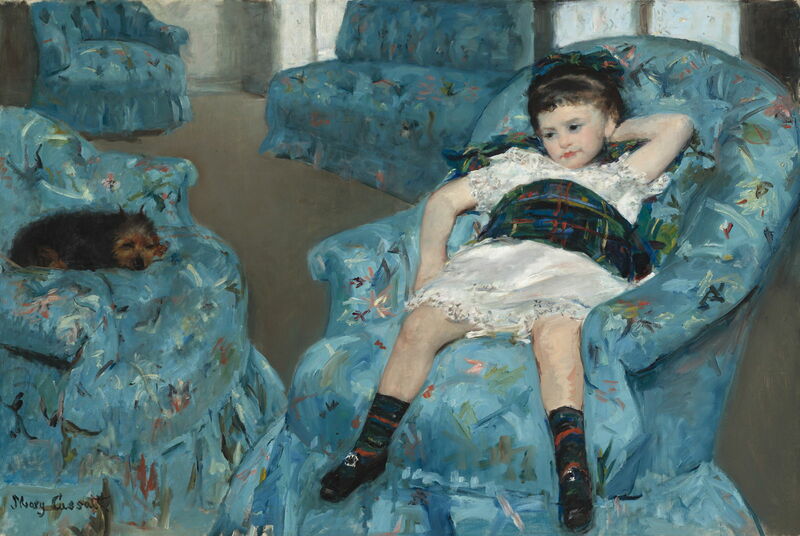 It is thought that Cassatt’s first real masterpiece, Little Girl in a Blue Armchair (1878), was shown at the Impressionist exhibition in 1879. The artist had initially submitted it for the American pavilion at the 1878 World’s Fair in Paris, but it was rejected. It shows the daughter of friends of Degas, and Cassatt acknowledged the help of Degas in its painting. This has been found consistent with examination and infra-red assessment of the work. The dog is a Brussels Griffon, probably the dog given to her by Degas, and was bred by Ludovic Lepic, another artist who had been introduced to the Impressionist group by Degas. Mary Cassatt (1844–1926), Moise Dreyfus (1879), pastel on paper, mounted on paper, dimensions not known, Musée du Petit Palais, Paris. The Athenaeum. 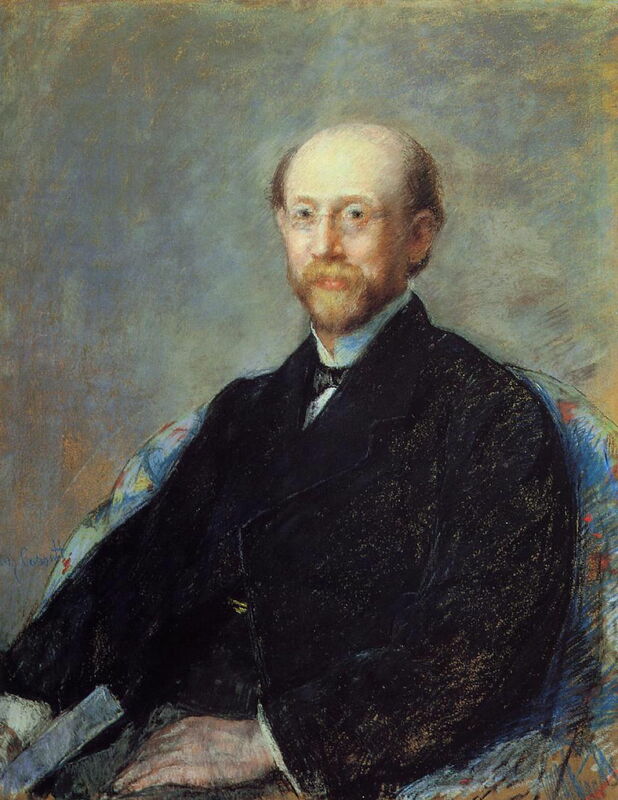 Moise Dreyfus (1879) is a pastel portrait of an art collector who became a close friend and early patron; this work was also shown at the Fourth Impressionist Exhibition. In 1894, a relative of his, Alfred Dreyfus, was accused of handing secret documents to the German military, which turned into a major national scandal, the Dreyfus Affair, accompanied by a wave of anti-Semitism. 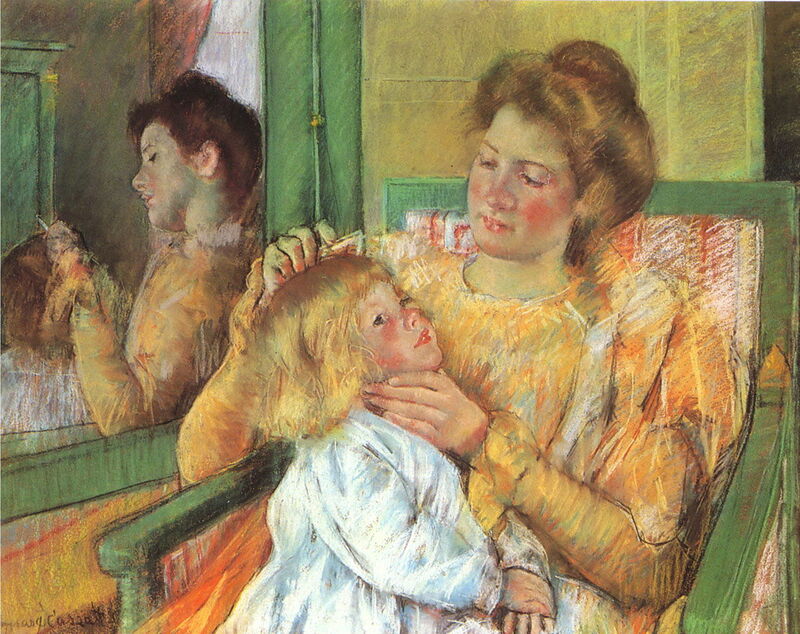 Mary Cassatt (1844–1926), Mother Combing Child’s Hair (1879), pastel, dimensions not known, Private collection. The Athenaeum. Mother Combing Child’s Hair (1879) is another superb pastel painting which would have involved Degas, no doubt, and shows her mature style, with rich mark-making in much of the painting apart from the skin. 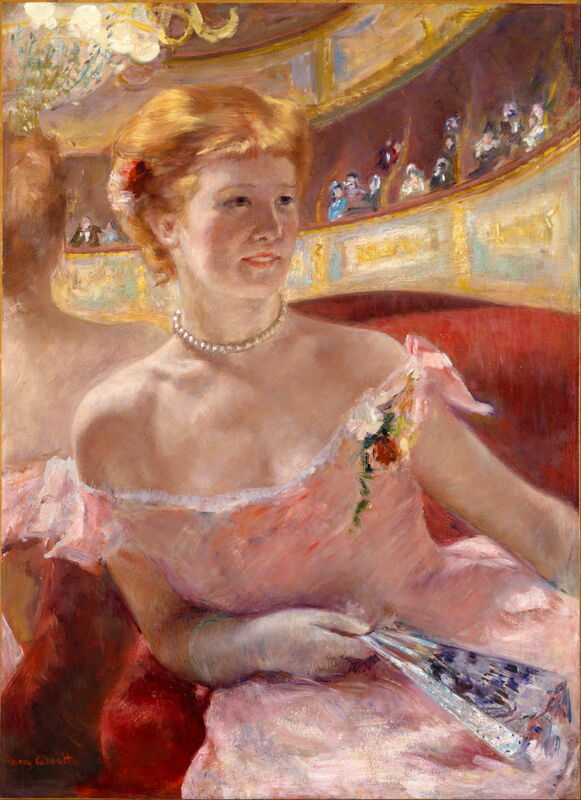 One of a series of paintings which Cassatt made of women at the theatre, Woman with a Pearl Necklace in a Loge (1879) used her sister Lydia as the model. Cassatt has here used a very sophisticated composition, with extensive reflected images. The woman is seated in front of a mirror, and the whole of the background, apart from the red back of the seat, is seen in reflection. This adds great depth to what would otherwise have been a very tight and close composition. Degas and other Impressionists made numerous paintings of the theatre and similar scenes, although his interests were primarily in the orchestra and in the ballet. Cassatt uses her paintings of the theatre to show the New Woman in idealised moments of pleasure – a marked contrast to the paintings of others. Mary Cassatt (1844–1926), Red Poppies (Les coquelicots) (1874-1880), oil on panel, dimensions not known, Philadelphia Museum of Art, Philadelphia, PA. The Athenaeum. 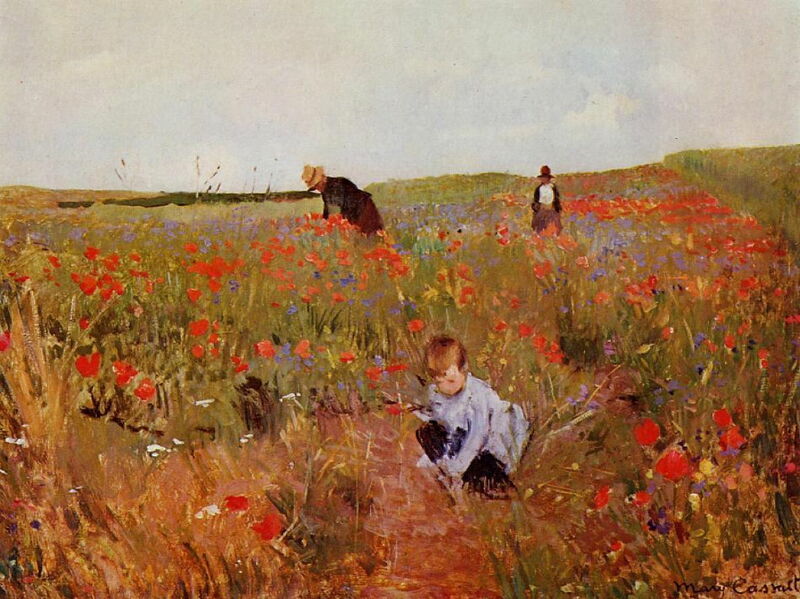 Cassatt could not be considered a true Impressionist without making at least one painting of figures in a field of Red Poppies, or in French Les coquelicots (1874-1880). She chose to include two countrywomen and a child, in keeping with her career-long emphasis on the lives of women and their children. During the late 1870s, Degas introduced Cassatt to print-making, and in the winter of 1879-80 Mary Cassatt worked hard mastering her technique with Degas’ press. Degas, Cassatt, Pissarro, and others were collaborating to produce a journal of their prints, a project which brought together great mutual enthusiasm. Posted in General, Life, Painting and tagged Cassatt, Degas, Dreyfus, Gérôme, Impressionism, painting, pastel, prints, Sartain, women in art. Bookmark the permalink.